Visit and admire Ancient Olympia. 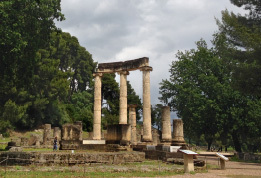 Olympia was one of the most important sanctuaries of antiquity. A temple dedicated to the father of the gods Olympian Zeus. There were born and took place the Olympic Games. The Sanctuary of Olympia lies at the southern slope of the wooded hill of Kronos, between the junction of Alpheus and Kladeos River. The valley between the aforementioned rivers was full of wild olive, poplar, oak, pine and maple trees, which is why the temple was named Altis, which implies grove. Altis is enclosed by an enclosure within which the main religious buildings are located. Outside the enclosure the following auxiliary spaces were located: the priests' residences, the baths, the athletes' preparation areas and guestrooms. Since Early Helladic Age, there was a residential facility in the region. 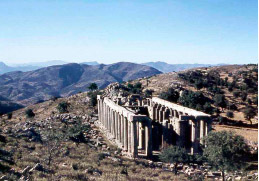 Around 1200 BC, in the area of the sanctuary, a Doric gender, called Aetolians, was installed. Then, Olympia, probably, became from habitation place to a place of worship to God Zeus. Over the centuries, the architectural plan of the sanctuary was formed, which was completed at the end of the 4th Century BC. Olympia was always the place for political visibility for great personalities such as Philip II, Alexander the Great and all his successors. The end of the Zeus's Sanctuary began in 393 AD, when Theodosius I prohibited the operation of the pagan temples by decree. In 426 AD, Theodosius II ordered the destruction of Altis buildings. The total destruction of the sanctuary derived from two strong earthquakes in 522 and 551 AD. 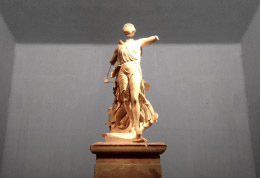 Olympia was forgotten for many centuries until the 19th Century, when early research took place. Nowadays in Olympia, among the numerous monuments and buildings, you can admire works with exceptional awe. Phidias's workshop, built for the construction of the gold and ivory statue of Zeus by Phidias. 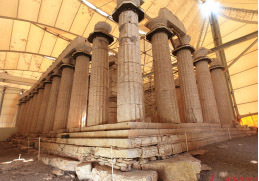 Zeus's Temple, the largest temple of Peloponnese and is considered the perfect "expression" of the Doric temples. Echo's portico that separated Altis from Stadium and took its name from the acoustics. The stadium that hosted the Olympic Games of antiquity, its last reconstruction dates back to the 5th Century BC. 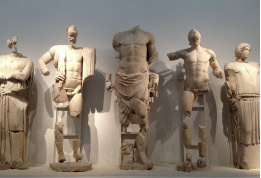 The famous Hermes of Praxiteles and the Nike of Paionios along with thousands of other remarkable findings hosted in the museum of Ancient Olympia. Some findings from the first excavations in 1829 are located in the Louvre Museum. 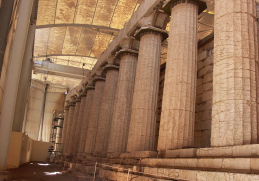 Visit the Temple of Epikourio Apollo. Located 87 km away from our hotel. The Temple of Epikourio Apollo is the first perfectly preserved temple in which all three architectural styles of antiquity are represented: Ionic, Doric, Corinthian. The Temple is oriented from north to south. Moreover, the Temple is build in a position, altitude 1,131 m., named Vassai, which is an ancient name meaning small valley in the rocks. It is dated around 420 BC and it was built over an older temple by the inhabitants of Figaleias in honor of Apollo for saving them from the plague. Since 1902 specialized scientists and archaeologists are trying to restore and maintain the temple. Discover a small paradise: Mercouri Estate. Located 4 km away from our hotel. 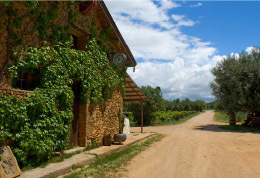 An estate full of vineyards and olive trees owned for almost 150 years in the same family. In 1865, Theodore Merkouris fascinated by the area near the city of Pyrgos Ilia, bought 600 acres of land including a forest between them. The land was planted with raisin which was the main export product of the century. Merkouris was visionary entrepreneur, thus arround 1870 he planted Refosko roots, which brought from Italy, complementary to raisins. 10 years later, the blight destroyed all crops and hence the production. Thus, the estate ended up in the possession of the bank. 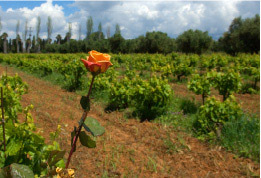 Leonidas Mercouri, son of Theodore, rented the estate from the bank and began to cultivate it in order to buy it again. In 1915, a modern winery and an oil mill was built. The production was intensified and reached Trieste. The Refosko was naturalized and acquired a local name: Mercuri In 1936, after the death of Leonidas Mercouri, the estate owners were his two daughters, who with the help of Kanellakopoulos (husband one of Mercouris's daughters) continued raisin production until 1960. While Mercouris's daughters had the general command of the estate residing in their grandfather's old house, Kanellakopoulou brothers, the new generation of the family, were seeking for new businesses in Athens. The fourth generation of Mercouri started in 1989 a systematic effort to revive traditional crops in order to produce branded products. Mercouri estate is one of the most beautiful landscapes of Peloponnese. Start your tour from the old stable. There you will see all the machines and tools that have been used over the years. Admire the old, Italian architecture mansion. Walk through the first Refosko vineyard. A little further, 100 acres Refosko, Mavrodaphne, Avgoustiatis, Merlot, Mouverde, Viognier and a small vineyard of Grenache Rouge on the seashore to gaze are unfold. 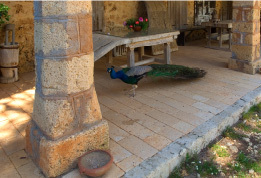 Finally, pass through the olive grove with the beautiful olives and the old stone path. Pass next to the roses planted in old barrels and start every vine row and next to the palm trees standing imposingly in the paradise called Mercouri Estate. Conquer the majestic Chlemoutsi castle. Located 63 km away from Katakolo and 45’ from our hotel. A castle built on a hilltop with panoramic view of the valley of Ilia and Ionian Sea. Its construction began in 1220 by ruler Geoffrey I Villehardouin and was the strongest fortress of the Frankish principality of Achaia. Since then, Greeks, Venetians and Turks have conquered the castle, but the original Frankish character has been maintained. 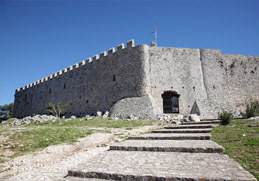 Today, the castle is an excellent example of the Frankish fortification art in Peloponnese. The castle consists of two enclosures. 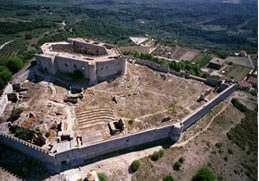 The interior enclosure is built on the highest point of the hill and was the residence of the castellan or the prince. 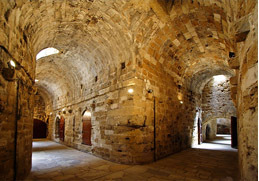 A series of vaulted rooms are around a large central courtyard giving the enclosure the shape of an irregular hexagon. In the exterior enclosure, which extends north and west, are still preserved ruins of buildings, tanks and a Turkish mosque. Every summer, the castle is flooded with people who want to attend concerts and theatrical performances, which is an ideal setting on warm nights with a full moon. Request for more details about the schedule of events and will be pleased to book tickets for you.